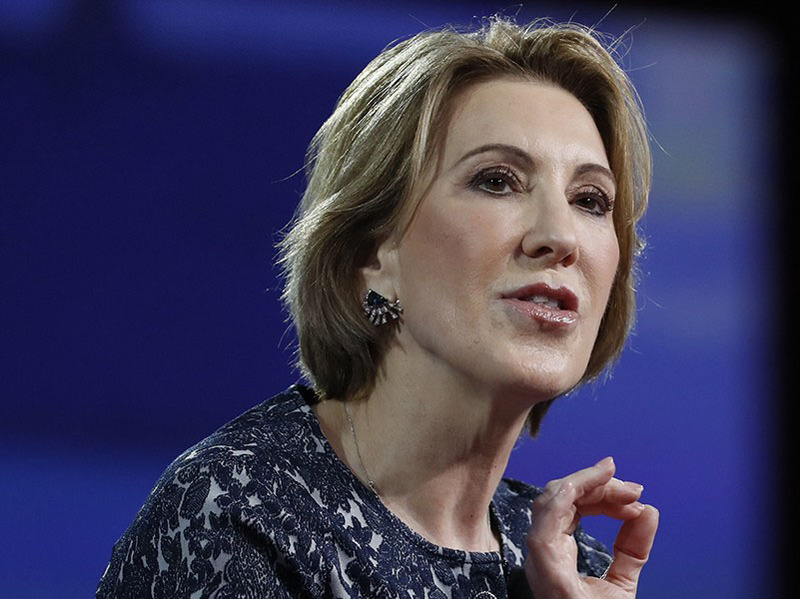 Carly Fiorina is an American businesswoman known for being the CEO of HP and running for President of the United States in 2016. But what people may not know is that she’s a passionate leader that’s always searching for answers and encourages a plurality of voices to reach them. Her new podcast By Example: A Leadership Podcast is filled with wisdom from world leaders like John Maxwell and Colin Powell and is recommended listening for anyone who wants to make a difference in their own life and in the lives of people around them. I gotta admit; I was a little taken aback when I was asked if I wanted to talk to you at first because of the narrative of the media. Originally, I didn’t think I liked you. Then I listened to your podcast, talking about empathy, and listening and understanding. And those were things I liked. I loved what you said on the podcast about how people don’t start out evil or bad that it comes from a fear of something and grows from there. I wonder if you could talk about that a little bit? CF: Well, one of the things I’ve learned is that everybody is afraid of something. And actually, in a way, we never lose our fear, but If we’re lucky, we learn to overcome it. I started out as a secretary in business, and I had dropped out of law school. I was a philosophy major and I just did not have business success written all over me, in fact, just the opposite. My very first real job in business was with AT&T and back then many of my colleagues had their meetings in strip clubs. That’s what they did. And my colleague, an older gentleman, probably thought I wouldn’t go there for my very first business meeting, but he wasn’t going to change the meeting for me. So long story short, and I talked about this in my upcoming book, Find Your Way, I decided to go, but I was terrified of everything you can imagine I would be terrified of. I overcame my fear and said to my colleague, “You’re not going to dismiss and diminish me. I’m gonna meet these clients and try to do my job, no matter how terrible the circumstances are.” What I came to learn later was, he was afraid of me because I was the brand new model with an MBA, and he was a guy close to retirement. And he thought, “I’m getting swept out the door, and nobody values all the work I’ve done.” That realization that he had done something really bad to me because he was afraid of me, never left. And unfortunately, I think we gather into our tribes so often to protect ourselves from others who we might think are going to do something bad to us. That’s absolutely true. I’ve been thinking about how harmful labels are like the word “feminist.” Obviously, as a woman, you want women and men to be equal, but so many people get turned off by the word even though the definition just means that you want women and men to have equal rights. CF: A label is a way of deciding that you understand someone without having to spend a moment actually understanding them, that’s what a label is, If you throw a label on somebody, what you’re basically saying is, “I’m not going to spend any time or any energy actually getting to know you or understand you, I already know who you are.” Unfortunately, politics is filled with labels, but it doesn’t help us understand each other better, or collaborate any better and it actually makes problems worse. How do you get past that and make friends with leaders who use labels and get them to understand where you’re coming from? CF: I don’t think leadership is about position or title even though we call a lot of people leaders because of their title. So if someone has achieved a certain position or stature, etc. the label we put on them is “leader”, and the truth is often they are not. They’re just people who’ve achieved a position or title or fame. Real leaders focus their energies on problem-solving and changing the order of things for the better. This means they collaborate with others, which means they have to understand others. And that’s why I talked, as you noted in the beginning, about humility and empathy. You’ve talked about how we couldn’t acknowledge slavery. Why do you think so many of us have a difficult time acknowledging painful things from the past? CF: The reason I wanted to do the podcast is that I think we always underestimate the power of an honest conversation. I think there is so much noise in our system that is anything but an honest conversation. And I think that’s true in our communities, in our families, and in between individuals. Why do people have so much difficulty with an honest conversation? One of the reasons might be because they’re afraid they’re going to be blamed or labeled. Another reason is that they don’t think about the still ever-present consequences of the system of slavery. They think, “oh, slavery’s in the past, why are we still talking about it?” And because the economic system of slavery was so powerful, systemic, endemic, and baked into the economy and the culture there are near and present consequences that still persist to this day. CF: It does say something good about this country that President Obama was elected, but it doesn’t say that all the problems are solved and that we don’t have any bad things to deal with here. One of the problems often seems to be this “both sides” narrative like how Charlottesville introduced to the public that the Nazis were still a thing and a lot of people didn’t denounce them because they’re on the same side as far as voting and power and like you talked about tribalism. So many people want to assign blame for certain things like governor Northam, but for other things like the Covington kid they’re terrified of assigning blame. CF: I think the tribal nature of politics is terrible and a disservice to citizens of this country and becomes like sports, you know, loyalty to the team. That isn’t what it should be about, but it’s what it has become. We’ve devolved into these opposing tribes and teams. And by the way, George Washington said in 1789, “The trouble with political parties is they will come to care only about winning.” I think that’s true and because everyone’s so focused on winning in politics, it means loyalty to the team is elevated above everything else, and you can’t have very honest conversations. CF: Well, yes, exactly. People are focused on winning as opposed to leading or principles. And by the way, back to your former question about blame. What happens is everybody blames each other. Blame games are a huge part of politics, but there’s a big difference between calling out unacceptable behavior and blaming everyone else who happens to have the same political figure as their leader. We tend to lump everybody in with their team. There are bad actors in every tribe, and an honest conversation acknowledges that and says, “I’m not going to paint everyone with the same brush, but I am going to call out bad behavior.” People can make mistakes and we shouldn’t condemn them forever, but “you will not replace us” marching to Charlottesville with torches that is absolutely unacceptable. The only option is to condemn that behavior unequivocally, no matter whose team they’re on. Our systems just aren’t set up for that. How can we change that? CF: I’ve concluded that the only way we’re going to change it is if citizens decide to change it. I have given up for now expecting politicians to role model the appropriate behavior, and they’re not going to because they’re in a system that rewards them for winning and raising money. You win, and you raise more money, and you get people all fired up about the team and get them afraid and get them focused on blaming somebody else. So the work I do now is about having more honest conversations. How can we lift up more real leaders, not people with position and title, but people who are collaborating with others, and trying to solve problems in their community? I think that’s where I and others can have an impact because somebody once said, “politics is downstream of culture.” If you look at our culture, we tend to lift up conflict, controversy, blame, etc. I’m right, you’re wrong. I win you lose. The more outrageous somebody is, the more famous they are. That’s kind of the politics we’ve got right now. CF: The college admissions scandal is on one level appalling and disappointing, but on another level, it’s so predictable. Parents are so hung up on what school their kids go to as if it somehow says everything about your kid on an appearance level. Are we surprised that people of privilege are using that privilege for the attainment of superficial success? I’ve hired countless people in my life and never have I cared where they went to college. I want to know, who is this person? What is their character? What hurdles have they overcome? How much resilience do they have? How creative are they? We’re so hung up as a culture on the external trappings of success and that’s why people use their privilege to ensure that their kids get into college. A lot of people just hate the phrase “white privilege.” How do you get them to realize that it is a problem? CF: There are white people with no privilege, just as there are some, although much fewer, people of color who have privilege. But I think if you look around and get outside your tribe or your community, there is just no doubt that many of the things we have make us privileged. The privilege and the opportunity of a stable home, of a good education, or of an opportunity to get a job are huge privileges. It doesn’t make us bad people that we have them, but we should understand the incredible impact of that privilege and focus us more on making sure more people have the benefit of a stable home, or a good education or the opportunity to get a job. If people don’t have those things there are real consequences in their lives. If we had to experience what they had, then we might have done some of those bad things too. Minimum wage has been so low nationwide for so long that I feel bad when I go to a drive-through and think about the seven dollars an hour they’re making. CF: If you want to solve a problem, you have to be clear-eyed, and realistic and complete in your description of the current state. Where are we actually? To the point of income inequality, the rich are getting richer and the poor are getting poorer. Income inequality is getting worse, not better and yes, privilege begets privilege. Those are all realities. We don’t have to blame somebody to state those realities, but together we do have to acknowledge the realities of where we are, otherwise, we’re never going to solve the problem. We’re just going to argue about the problem. One of the problems with our tribal politics is we never start by agreeing on what the problem is. We don’t have a common understanding of the current state. There’s always a lot of blame to go around. I’m from the Christian culture where there’s such blame back and forth about so many issues which is why we need more honest conversations like this. CF: There is a lot of power in honest conversations, particularly in people who are different, and may I say this isn’t how most media conversations go. Well, I’m not interested in gotcha questions or putting anyone down without reason. I know we have some differences but I wanted to find out what we had in common. CF: You always get more information when you ask open-ended questions, not gotcha questions. All of us have our preconceived notions and sometimes think we’re right without knowing the full situation, and sometimes all of us would do better if we just admit it, including journalists. CF: I may not have the perspective that you have, but in my organization, we have college students who are here as interns and sometimes we don’t pay them, but they get college credit. So I can’t really answer your question, but I see where you’re coming from. And ultimately, isn’t seeing where the other person is coming from the best outcome of a conversation about difficult topics?